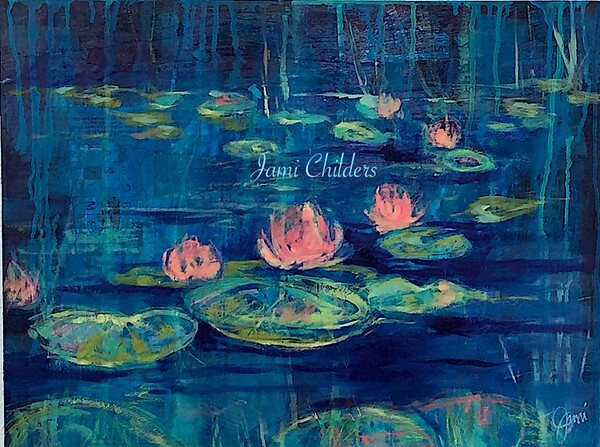 Jacksonville Florida artist Jami Childers has been painting & drawing most of her life. 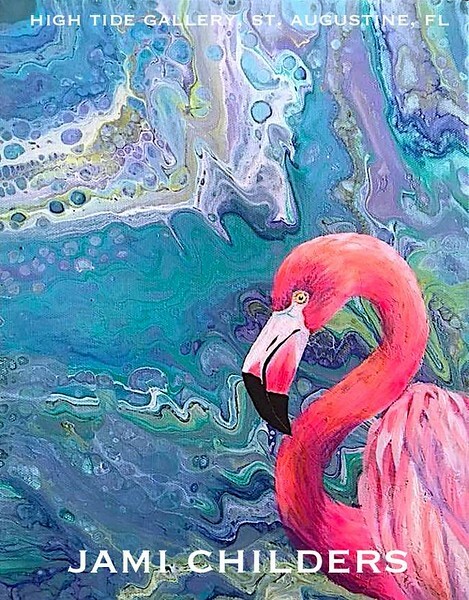 She started painting at an early age with her grandfather. 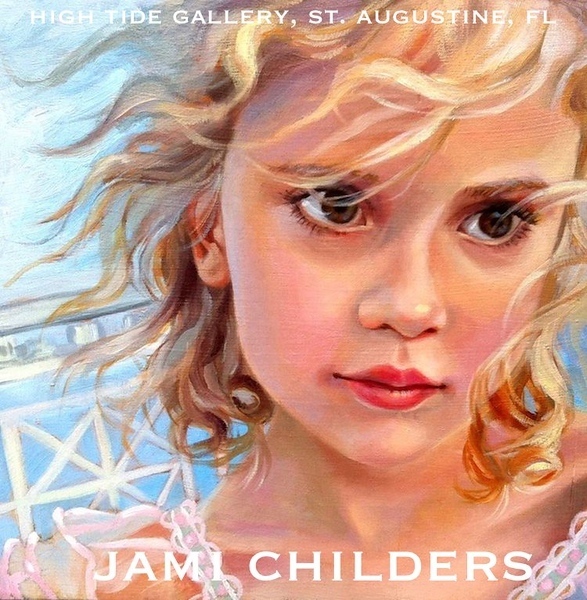 Jami is primarily a commissioned portrait artist and also enjoys the land and seascapes of Florida. 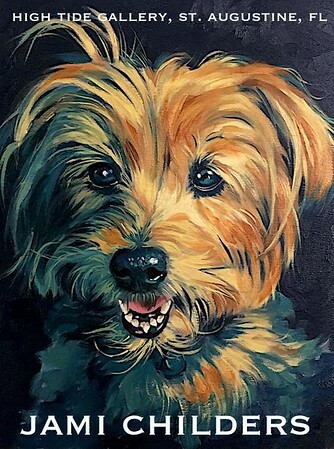 Mixed media is her favorite form of expression when interpreting portraiture. Her portraits have interesting layers of material in the background of her work that draw you in. The faces in her portraits have areas of transparency that allow you to see through to the dimensions in the background. 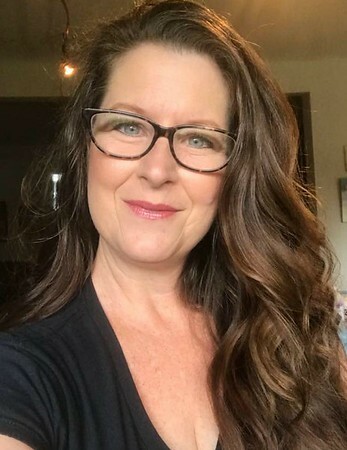 Jami often chooses larger than life, close up compositions of faces because she wants to get deep into the detail of the eyes of her subjects. It is in the eyes where you can almost feel the subject's personality. 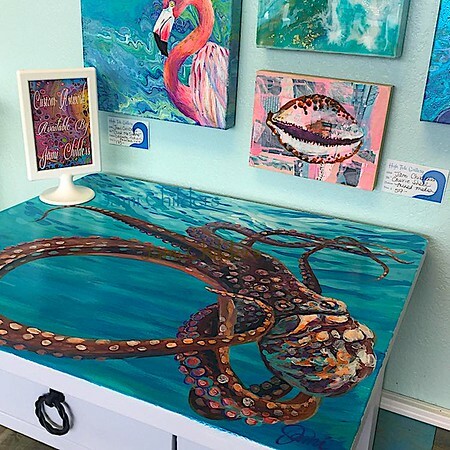 Her new avenue of acrylic "poured" paintings are a top seller at High Tide Gallery in St. Augustine, FL. 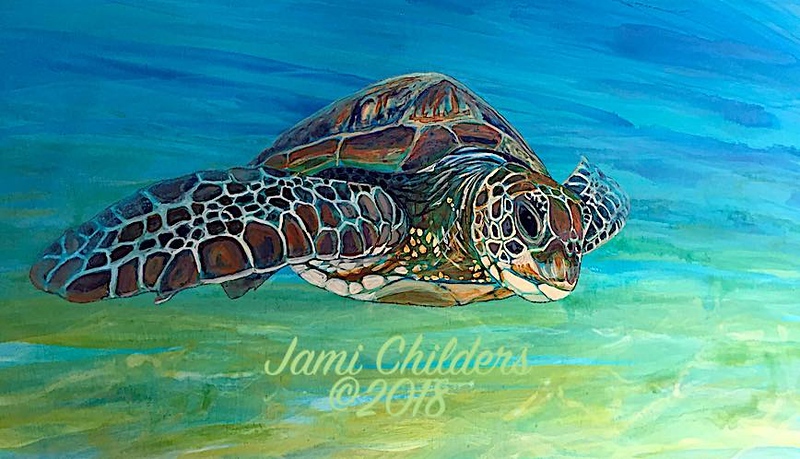 Jami has won awards with the Jacksonville Watercolor Society, The Jacksonville Coalition of Visual Arts & The St. Augustine Art Society. Most recently, she was awarded 2nd & 3rd place in two shows at Southlight Gallery. 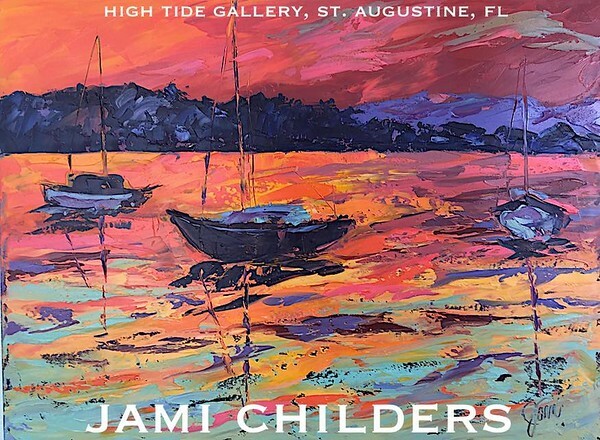 "Colorful Koi" is an original oil painting on 62 x 50 inch canvas by High Tide artist Jami Childers. 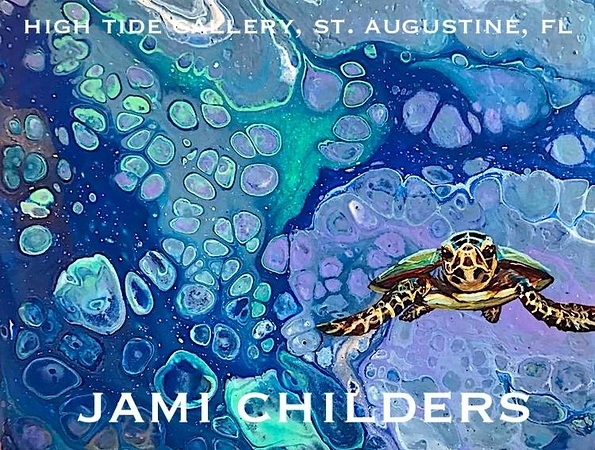 (copyrighted image - all rights reserved by Jami Childers and High Tide Gallery) Available Jami Childers art is for sale on www.ShopTheHighTideGallery.com"
"Color Me Shrimp" is an original poured acrylic painting on 11x14 inch canvas by High Tide artist Jami Childers. 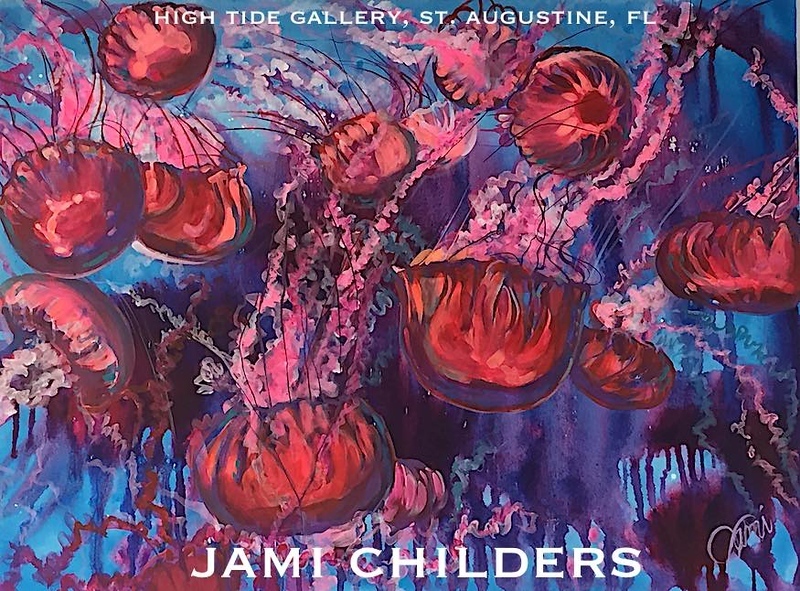 (copyrighted image - all rights reserved by Jami Childers and High Tide Gallery) Available Jami Childers art is for sale on www.ShopTheHighTideGallery.com"
"Jellies Jubilee" is an original acrylic painting on 48x36 inch canvas by High Tide artist Jami Childers. 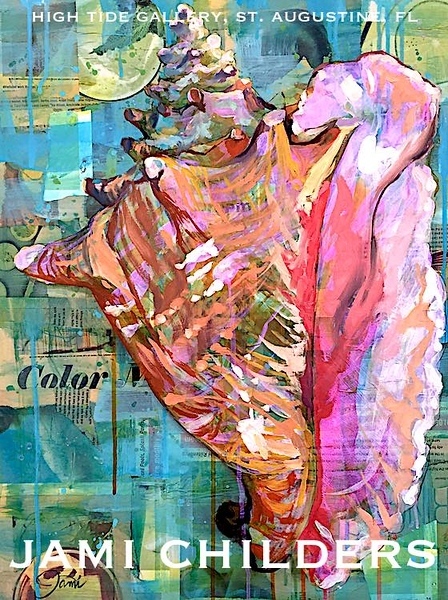 (copyrighted image - all rights reserved by Jami Childers and High Tide Gallery) Available Jami Childers art is for sale on www.ShopTheHighTideGallery.com"
"Conch Life" is an original acrylic and mixed media painting on 18x24 inch canvas by High Tide artist Jami Childers. (copyrighted image - all rights reserved by Jami Childers and High Tide Gallery) Available Jami Childers art is for sale on www.ShopTheHighTideGallery.com"
"Don't Worry, Be Happy" is an original acrylic poured painting on 6x8x1 inch wood box by High Tide artist Jami Childers. (copyrighted image - all rights reserved by Jami Childers and High Tide Gallery) Available Jami Childers art is for sale on www.ShopTheHighTideGallery.com"
"Sunset Bay" is an original acrylic palette knife painting on 18x24 inch canvas by High Tide artist Jami Childers. 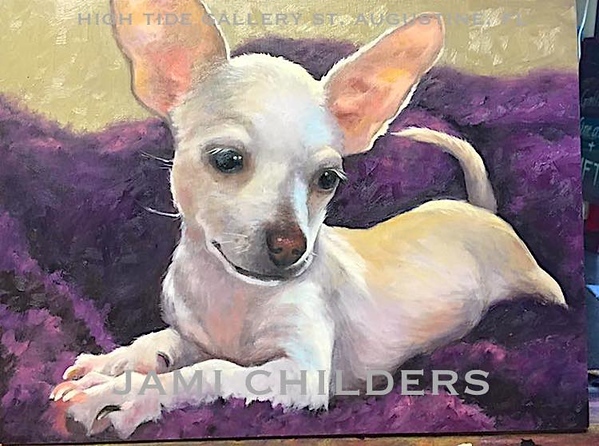 (copyrighted image - all rights reserved by Jami Childers and High Tide Gallery) Available Jami Childers art is for sale on www.ShopTheHighTideGallery.com"
"Blue Terrier" is an original oil painting on wood by High Tide artist Jami Childers. 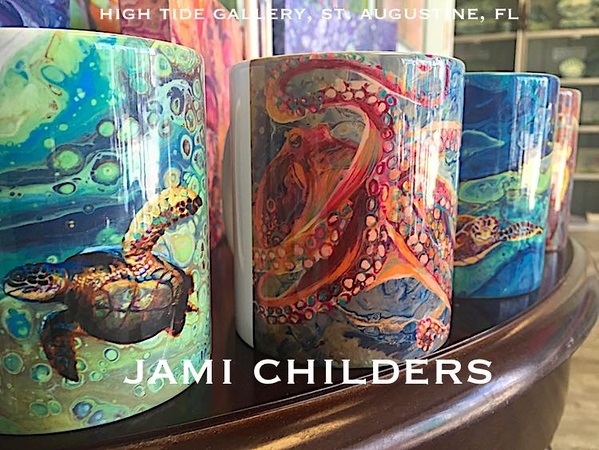 (copyrighted image - all rights reserved by Jami Childers and High Tide Gallery) Available Jami Childers art is for sale on www.ShopTheHighTideGallery.com"
Ceramic mugs printed in St. Augustine, FL by High Tide artist Jami Childers. (copyrighted image - all rights reserved by Jami Childers and High Tide Gallery) Available Jami Childers art is for sale on www.ShopTheHighTideGallery.com"